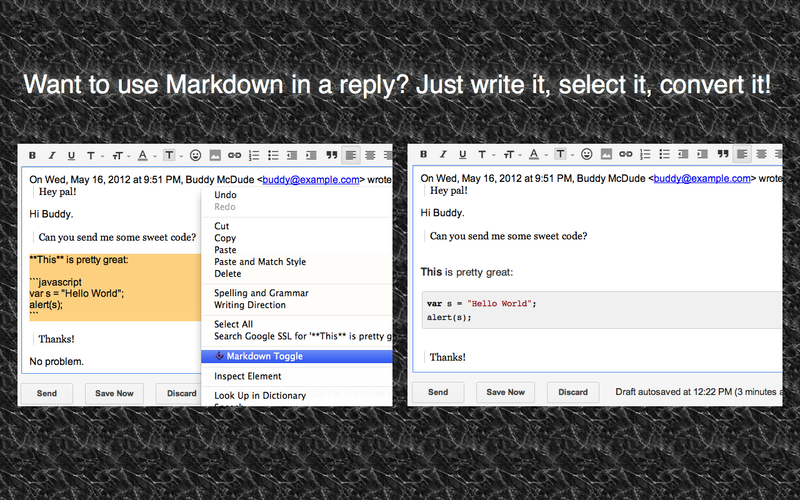 Try "Markdown Here" with Evernote Web for Markdown support! Given Evernote Web's lack of keyboard shortcuts, Markdown Here goes a long way to improve keyboard efficiency. I’m the developer of Markdown Here. Thanks for mentioning it, Stefan. If anyone has any feedback or questions I’d be happy to hear them. I should clarify that it wasn’t the “community” that said MDH “works great” with Evernote — it was me. So… take that with a grain of salt. And report a problem if you find one. This is really cool, I have only just started using it, but it s much easier then copying and pasting from an external source. Unfortunately, I don't use a web interface very often, but If you made this into a windows right-click menu option I would be pretty excited. Thank you soo much Stefan. I have been looking for ways to view my Markdown in Evernote, and this works perfectly. Plus is basically works on any website with a text field that I type Markdown into. Life saver! Fooey. Markdown here stopped working for me within Evernote Web. I'm using Firefox. Oh well, at least it works well in Gmail. I just did some testing, and in Firefox there are too many blank lines appearing. This totally breaks tables and causes extra lines in code blocks. Is that what you're seeing, or something else? Also try restarting your browser. There's an outstanding bug where sometimes Markdown Here in Firefox mysteriously stops working and requires a restart. It seems to me that DOMscraping - which such an extension must do - is prone to the target page changing shape WITHOUT NOTICE. That's not a reason not to attempt such an extension - but I expect the owner to have to rework it occasionally WITHOUT NOTICE. The idea of writing an extension (and I've written one internal to my employer before) for interacting with Evernote Web is, I must admit, attractive - despite what I said above. If I did one it'd probably add table editing functionality such as "add n rows below this one". You're correct in principle: Evernote could certainly change their interface in such a way that Markdown Here stops working -- possibly even forever. But it's not really as fragile as that. Evernote -- and almost every other "rich edit" web thing -- uses an edit box with the "contenteditable" attribute set. When you click the Markdown Here button, it reads the contents of the box as plain text (Markdown), renders to HTML, and sticks the HTML back in the box. That's it. There is, of course, annoying variability between the way different sites use the edit box, but it mostly works. In fact, it works so well that I didn't actually target Evernote when I created it -- MDH was only targeted at webmail (Gmail in particular). But then I (and other users) discovered that it works in a lot of places. You can see the list of at-least-somewhat-compatible sites I've compiled here. Edited to add: And if/when Markdown Here does break... that just means you won't be able to use it anymore. It won't damage any notes you've already created with it. So the possible future breakage shouldn't dissuade you from using it (except that you'll be sad). Thanks for the tip, I have installed Markdown Here. I am also doing some testing with Byword, available on the App Store, which has a Evernote plug-in. @Adam Pritchard I just edited your wiki to point out that the reason Markdown Here might work with Evernote is that it uses TinyMCE albeit Version 3 rather than the current Version 4. Might have some bearing on how well or badly it works. Now if we could only get TinyMCE upgraded - and with some plugins - in Evernote Web life would be good. @Adam does your code live well with TinyMCE plugins? @Adam does your code live well with TinyMCE plugins? I was delaying answering so that I could get a chance to test. But it looks like I'm not actually going to do that testing, so... I have no idea! I don't really know much about TinyMCE, and I don't know anything about its plugins. But if you (or anyone) learns anything, please let me/us know. I'm finding that Markdown Here does work well with markdown, right up until you try and add additional text to a previous document, at which point it mangles everything. You will find that markdown here is confused about what is and isn't markdown, and will unrender anything that was previously entered . This makes it pretty much useless for me. This is quickly becoming a high-priority item and I'm going to dig into it properly soon. This will be in the next release (unless something is horribly wrong).